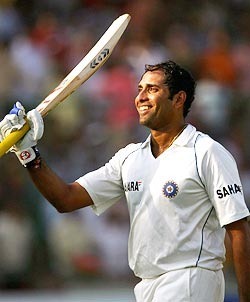 Thrice this year he was the one who helped turn around the team’s fortunes at Mohali, P Sara Oval and Durban. Laxman’s batting in every sense of the word was nothing short of sensuous. 2010 was his year after 2001. Never thought I’d turn into an England fan against Aussies. Never – but then again the Aussies are not Waugh’s warriors and are a fairly easy lot to hate. On the other hand the fascination that started with Flintoff and Pietersen’s magic in 2005, has stayed on and moved to Swann, Strauss, Trott, Broad, Anderson, Cook and the lot! Yeah seriously never thought I would be craving for an Ind-Eng matchup. The Ashes have been retained in fine style, the first time in 24 years on Aussies soil. A series win awaits, Aus is in absolute disarray and the Englishmen are ready for the final kill. His half-century of centuries and the ODI Double Hundred. I’ve said a lot on him, I’ll just keep quiet and thank the real GOD for giving us this gem. This innings reminded me of the real Aussie spirit. I watched that innings live ball-by-ball. He pulled off a miracle single-handedly and took Australia into the final from a match where winning looked improbable. For a man who has never got his due cause he stepped into a team full of greats, he remains today the sole warrior, the last man standing for this dying Aus team. He did his bit once again in this Ashes; and is the sole reason they could manage a bit of honour and fight in the series. Sri Lanka was and never will be among my favourite sides, but when they tasted victory in Australia this year, I was pleased. They have been meted out some shoddy treatment by the Aussies in the past and it was fitting they replied to all the Aussies – players and media alike through their actions on the cricketing field. Malinga & Mathews, for this incredible win – you deserve to be in all lists that will recall the best cricketing moments of the year 2010. As I end my post, I have to mention two of my favourite men again, they will be remembered the most whenever anyone recalls 2010. Both unsung heroes of their teams – the real men of the match – Laxman & Hussey. To them we owe a standing ovation.